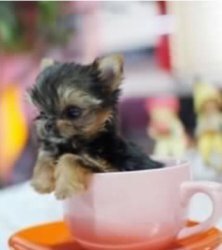 True Teacups *Micro Authentic* Yorkshire Terrier Puppies are ready! Quality Quality Quality... Baby Doll face Tiny Teacup Yorkshire Terrier babies ready now. Genuine teacups as tiny as 1.5lb-4lb full grown. 5 year money back guarantee. These darling babies live to love you. Easier to care for than a cat. Devotion of a dog. Best of both worlds. -Extensive puppy starter kit includes all supplies, even your babies first outfit. Take home a living dream. The most discriminating buyer will be thrilled with the exceptional quality of these puppies. Serious, committed homes ready to add a family member only need apply. Entry price starts at $250 This is a 15-20 year commitment, get the dog of your dreams.